As you already know, I’m a big fan of packing light and always try to travel to Hawaii without checking luggage. You also probably already know that my top secret to packing light is to minimize the number of shoes I bring. Well, I’ve just completed my second trip with these hiking sandals and I am so pleased with how multifunctional they are, especially for adventures in Hawaii. They definitely make traveling light easier, because they serve so many purposes. I can wear these shoes for land sports like hiking and biking but they can also be worn in the water for crossing streams, kayaking or simply playing in the ocean. My hiking sandals replace the need for reef shoes. I’ve mostly worn them for day hiking in Hawaii. If I’m on a muddy trail or one that has a creek to cross, I don’t have to worry about them getting wet as these shoes are designed to be worn in water and they are quick drying. Even though it was snowing in Raleigh the morning I left for Oahu earlier this month, I wore these sandals to the airport and on the plane. I had my comfy cashmere socks on underneath to help keep my feet warm. Well, I wouldn’t win any fashion awards for wearing these shoes, but at least I didn’t have to check luggage. Just before landing, I removed my socks and voila, I was ready for the warm tropical environment of Hawaii. The brand of my shoe is Ahnu and I purchased these at my local REI for $40 on sale in October, 2008. Amazon is a good source for hiking sandals. Here’s a link to Amazon’s hiking sandals. I’d definitely recommend you consider picking up a pair of hiking sandals for your Hawaii vacation. This type of shoe gives you enough grip and stability for the various terrains you’ll encounter in Hawaii. Sometimes you just don’t know what sort of adventures you might find on your vacation and these shoes give you plenty of flexibility. They’d be the perfect shoe to wear for sightseeing where you may walk over uneven ground. For example, if you plan to drive the road to Hana, these shoes would be ideal for walking over lava rock, short hikes in Kipahulu, and taking a dip in a waterfall. I wish I had my water sandals when I hiked around the Waipio Valley Rim as I could have worn these shoes in to the waterfall pool rather than going barefoot over the jagged lava rocks. 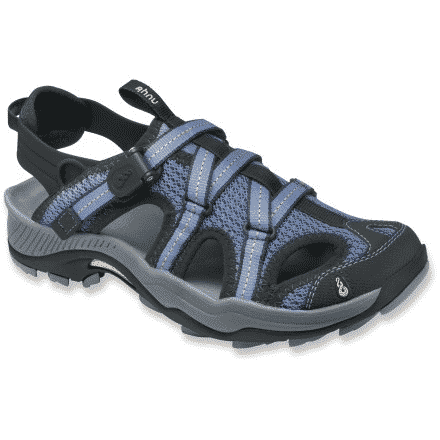 Hiking sandals with closed-toes also work well for some tours that require closed-toe shoes. 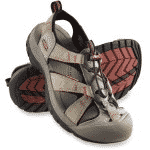 I’ve worn my hiking sandals (with closed-toes) on ATV tours and horseback rides which required closed-toe shoes. Break the shoes in before you go on vacation. I didn’t get a chance to break mine at first because I purchased them right before my vacation. At a minimum, I should have worn them the day I traveled. Since you most likely won’t be wearing socks with these shoes, you may be more prone to getting a blister. So, when your shoes are new, bring bandages and a pair of socks for back up. I did get blisters the first time I wore them, but I did hike in them for four miles that day. After the first trip, I didn’t have any more issues. If you plan to do some advanced hiking – like the entire 11 miles of the Kalalau trail, you might want to wear proper hiking shoes/boots. These shoes aren’t very good for long walks in sand as sand gets into the shoe through the holes. To be honest, there’s not really a good shoe for walking in the sand. Do you own a pair of water/hiking sandals? What do you think of them? What other shoe tricks do you use for travel to Hawaii? The closed-toe design is also great for Hawaii’s trails. There have been many times that I stubbed my toe on a rock or tree root–thankfully my toes are protected with this style of sandal! @ Evelyn – I bet they would work with stockings. The only thing I’d worry about is would “pills” build up around the ankle strap. I doubt they’d cause runs. @ Andy – thanks for bringing up the toe protection aspect. That can really be a sore toe saver. We actually bought pairs from Land’s End before we went — they were great, but you’re right about breaking them in. I was wandering the Hilo Farmer’s Market and, lo and behold, welcome to blister-town. We loved ours, though. Big recommend. @ Chuck – thanks adding your thoughts for letting us know that Lands End carries water sandals, too. Thanks for showing us these! They look wicked comfy! I am going on my first trip to HI in October this year, and was thinking about wearing flip flops… but I will probably just bring one pair and wear these shoes most of the time. We will be doing some biking and hiking, and most likely alot of walking around…. I think my feet will love me more if I wear these shoes instead. ha ha Thanks again! @ Christine – yeah, this type of shoe would be perfect for the type of outdoor sports you mentioned. You’d be wise to save the flip flops for casual sight-seeing and going to the beach. I’ve seen at least two different people wearing flip flops completely wiping out on trails. One trail was completely dry and the other one was a little bit wet and muddy. Enjoy your trip and if you try out this type of water sandal, please come back and let us know what you thought of them. These shoes look great! I am going on my first trip to Hawaii in about a month and these seem like a really good idea, especially with the amount of hiking that my husband and I plan to do. Thanks for having a great site! I will be sure to comment on these after I try them out! @ Amanda – I love my hiking water sandals. The more I wear them in Hawaii, the more I think they’re the perfect shoe. I have Teva sandals that are amazingly comfortable. Found them on Sierra Trading for about $35. first timer and going alone. looking for cottage rental near beach-island undetermined. read your wonderful sire,great info, yet i feeel overwhelmed. just want some fun in the sun and no mistakes on my planning. i am a private person, looking for that in accomadations. We have two pair of open toe hiking sandles…can I get away with them, switching to a surf shoe if we want to get into water or falls? Thanks! The shoe debate has gone on for a couple days around here! Maggie – you’ll probably be just fine with the open-toe hiking sandals. My only caution would be if your going to be hiking quite a bit in Hawaii Volcanoes National Park — especially in the dark when you’re more likely to stub your toes. 2. Bring the keens and a low cost water shoe for the beach. My reason to search for the perfect shoe is there seems to be several beaches that require a walk to access and I would imagine there are lots of places to encounter rocks and steep terrain. I also plan to bring a carry on so space is an issue. Wally – you might want to take a look at LandsEnd.com. They sell water shoes that look a lot like running shoes. Appreciate your post as we don’t want to have to take multiple shoes on our upcoming June Hawaii trip. I’m planning to take my Keen’s water sandals and was thinking of using them 100% of the time while there, however, I’m concerned that if the sandals don’t dry overnight, then I’m stuck with damp sandals the next day. Did you have any issues with drying? Thanks! I don’t recall ever having a problem with ours drying. For a back up shoe, you could buy or bring a small pair of flip flops.